Environmental noise is increasing in our everyday lives. It effects both workplace efficiency and personal health. Monitor noisy areas for safe levels of exposure. Ideal for monitoring traffic noise, alarm systems and workplace machinery. 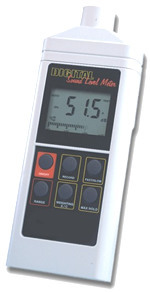 SL1200 Sound Level Meter  Low cost, portable instrument provides digital display of sound level from 40 to 130 dB. SL2100 Sound Level Meter  Portable instrument provides wider measurement range with larger, backlit display. RS-232 Output. HH1000SW Software  Log and organize your data all in one place through the RS-232 output on the SL2100. Software and PC connector included. Book mark this page and come back later for more interesting solutions to Sound Level measurement.